Many culinary delights await you on your journey. Visit our excellent cafés or sample our onboard catering. 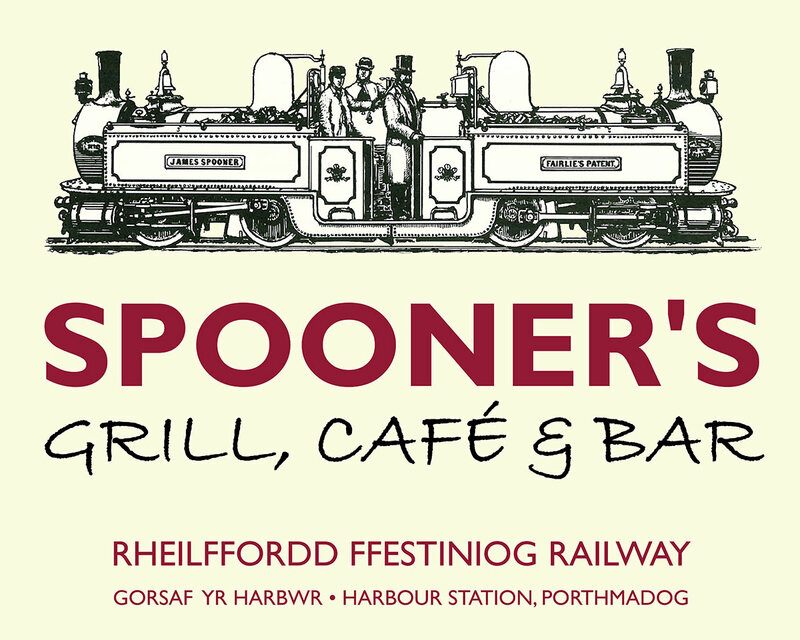 No trip to the railway is complete without a visit to Spooner's Grill Café & Bar in Harbour Station, Porthmadog. Our excellent café opens early so why not visit for a hearty full breakfast before starting your day or choose your own combination from extensive selection, all individually priced. If you are looking for a tasty lunch we serve a variety of light meals, sandwiches, pies and snacks or take a look at our daily specials board. All food is also available in takeaway boxes, so why not grab something to take on your train journey. Teas, coffees, cold drinks and a selection of homemade cakes and snacks are available throughout the day. Our CAMRA award-winning bar offers a wide choice of real ales on tap twelve months of the year, draught beers, bottled wines and a varied selection of malt whiskies including Wales' very own Penderyn. We have an excellent variety of beers from small independent breweries, including Porthmadog's own Purple Moose Brewery together with consistent beer quality and competitive pricing - so come and try a pint of something you've never had before! Please also visit Spooner's own website. Every Thursday is Curry Night! 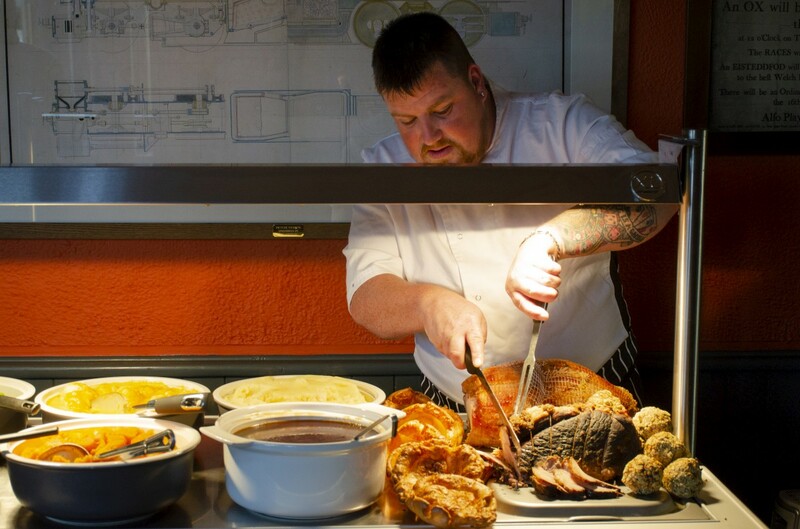 Tan-y-Bwlch Café is open every day from March until the end of October, serving a varied selection of freshly cooked hot and cold meals and snacks including pizza made to order, fish and chips, children's lunches, jacket potatoes and much more. 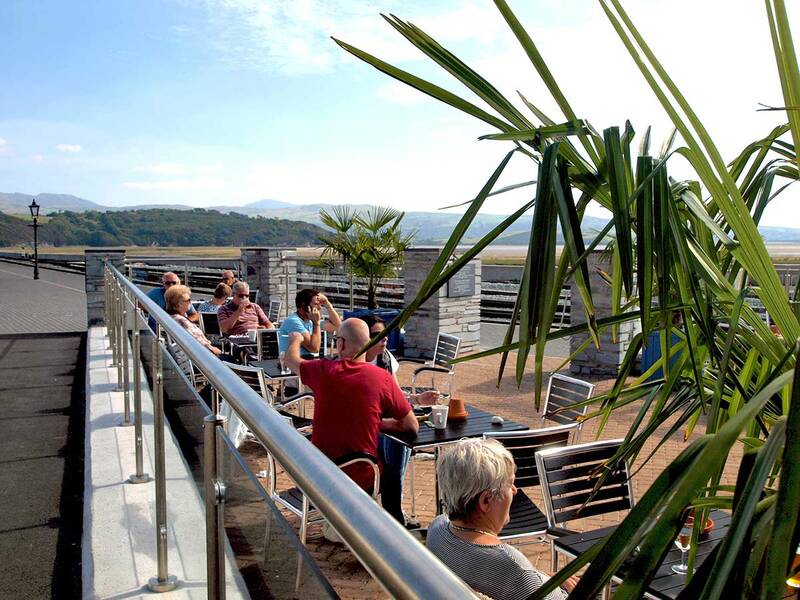 Or why not break your journey and pop in for a cup of coffee or a tasty Welsh Maid ice cream while enjoying the views over the Vale of Ffestiniog. Tan-y-Bwlch is also fully licensed and sells a variety of beers, wines and locally brewed Purple Moose beer. Tan-y-Bwlch is set amidst beautiful woodland countryside. You can sit indoors or out, either under the canopy or at picnic tables overlooking the station and valley. Parents can relax whilst their children let off steam in our newly-refurbished play area. If you want to explore further there are plenty of walks starting at Tan-y-Bwlch, including a family friendly nature trail to Llyn Mair (the nearby lake) where you can rest and take in the scenery. Why not take our Ramblers picnic lunch, available freshly made from Tan-y-Bwlch café, down to the picnic area beside the lake? There is a small gift shop inside Tan-y-Bwlch Café that sells souvenirs. Tan-y-Bwlch Café is available for hire for parties and other functions by prior request. Please phone 01766 590464. Most regular timetabled trains provide an at-your-seat light refreshment service throughout the journey. Our stewards will come through the train and take your order from the menu. The buffet car offers a selection of hot, cold and alcoholic drinks - plus confectionery, cakes and biscuits - all served at your seat. We have a selection of bottled beers including award-winning local beers and a Welsh bottled cider. An informative Traveller's Guide to the railway is also available on the train - to ensure that you get the most from your journey. During busier times of the year we add extra vintage carriages to our trains. These historic carriages do not have a corridor connection to the rest of the train and our stewards are not able to provide the same level of service in these carriages. There is usually a varied selection of take away food available from our cafés at Porthmadog and Tan-y-Bwlch which can be purchased before your journey. Hot food is available on all departures from both Porthmadog and Caernarfon. The refreshment trolley works its way through the train providing a selection of hot, cold and licensed drinks, plus confectionery, cakes and biscuits on all services. 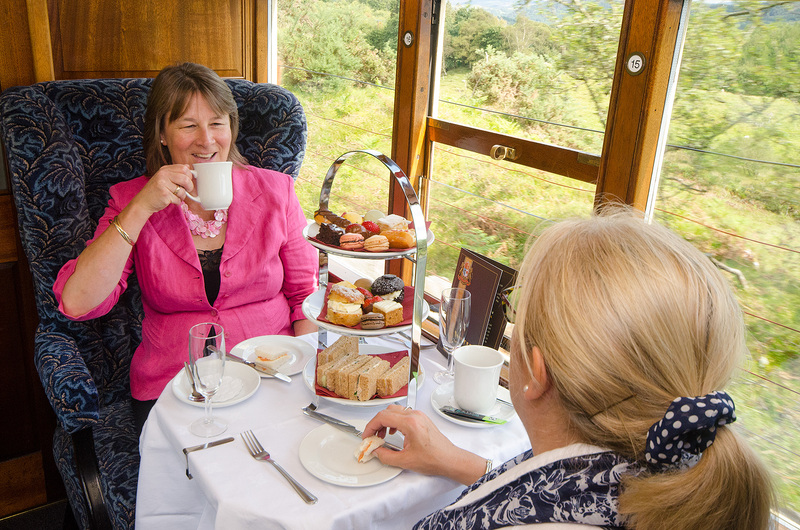 Sit back, relax and enjoy the enchanting scenery of the Snowdonia National Park and afternoon tea for two, as we take you on one of the top railway journeys in the world. More details including dates and fares can be found here. 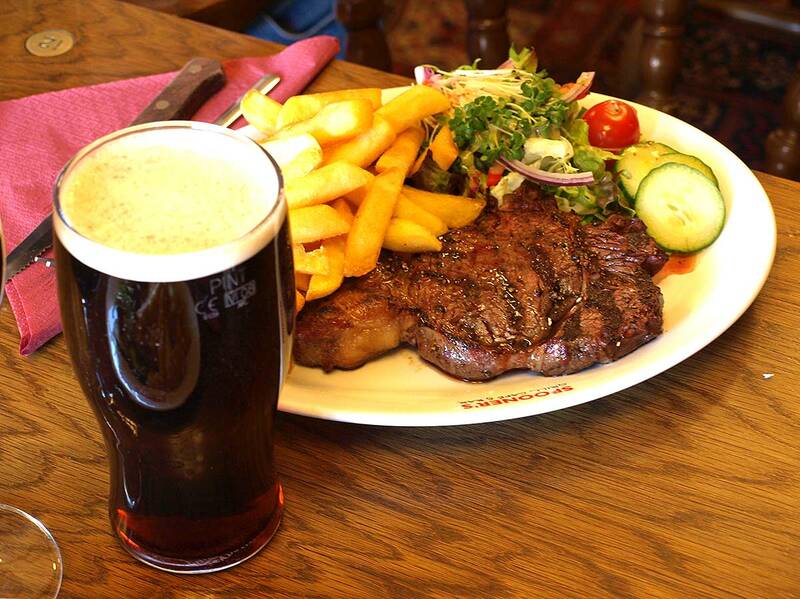 A juicy Spooner's steak and a pint - What's not to like? "Enjoyed an excellent pub meal after travelling on the Ffestiniog Railway. Excellent Purple Moose beer on offer and very tasty food in superb surroundings." A tasty selection of all your favourites made using fresh local produce. A full Welsh Breakfast or something lighter? Light refreshments served at your seat. A selection of meals to suit children. A selection of lunchtime specials to tempt you! 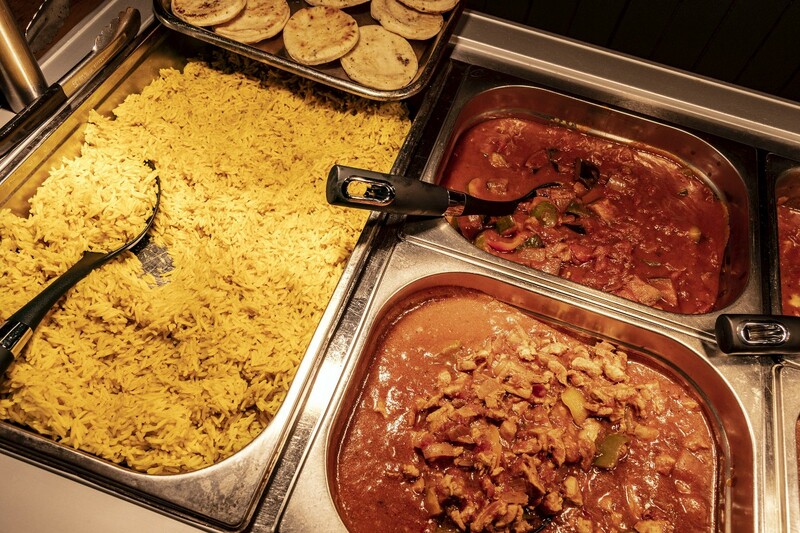 A selection of freshly prepared hot and cold food served at your seat.